6’ slider – How about those shots that glides across the hood of a car or desk. We can make that happen too. Those subtle movements make the most static object shots come alive. 6’ Porta-Jib – Like those shots that seem to float around the action? We can set that up fast with our 6’ Porta-Jib. Doorway dolly – Need a longer tracking shot? No problem. 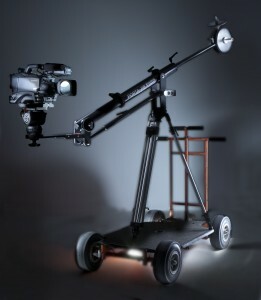 Our doorway dolly will not only carry all our equipment, but will get you that great tracking shot you need too.